International program of Advanced Teacher Training in Kundalini Yoga as taught by Yogi Bhajan. 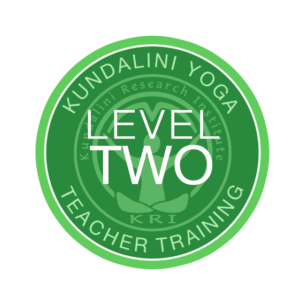 Course and tutors are approved by the International Kundalini Yoga Teachers’ Association (IKYTA) and the Kundalini Research Institute (KRI). In Level 2, through your personal practice, group process, deep interactive discussion and intense meditations, you will go through a transformation that will help you to deepen your own direct perception of the teachings. It will also serve to improve your ability to create and maintain the Sacred Space of a Teacher. Excellence is acknowledging your own divinity and guiding others to realise it within themselves. 240 hours of classroom instruction in the five level 2 modules listed. 60 hours of additional requirements to be completed outside of classroom time including a home exam. In general, applicants are expected to hold a KRI Instructor Certificate in Kundalini Yoga: i.e. Aquarian Teacher Level 1. A copy of this must be submitted with your application. However, long term KY students or yoga teachers of other disciplines may also apply. In this 50 hour course, cultivate the core skill for this coming age – the ability to recognize stress in ourselves and others and develop the tools to transform it and balance it with conscious relaxation. Kundalini Yoga prepares each of us to be teachers who act with undaunted spirit, exalted caliber and character, and the vitality to cross every crisis. With its biochemistry, neuro-transmissions, five winds, pranas, nadis and various physical and subtle organs. Subject to so much internal and external stress how can it become like gold and radiate? Vitality is the capacity of the nervous and glandular system to respond and adapt. It is also a sign of a harmonious relationship to the vastness of the cosmos and its laws. Stress can be the training ground to develop this capacity or it can produce a degeneration of this capacity. Explore the nature of our stress identity as individuals and cross-culturally. Use kriyas and meditations as well as other processes to identify our stressors and the tools you will need to balance and uplift ourselves and others. Flight to Athens, then a bus to the island of Evia. We can help you with your travel arrangements! In this 50 hour course, integrate authentic relationships into your life and your teaching. Explore and understand how we form, sustain and honor relationships. Our success as Kundalini Yoga teachers and as conscious human beings depends on our capacity to be authentic and respond from our hearts; our primary objective is to examine our relationships and improve our effectiveness, authenticity and awareness within them. Understand that our relationship to our soul and higher self is the foundation for authentic relationships in pur life. Include yourself in God by full participation in the human experience. From incarnation of your spirit through living conscious relationships to merging with the divine while alive. Every relation is a manifestation of the relation between the individual soul and the Universal Soul. Practical discussions, exercises and meditations that give a deep insight into the most basic nature of man and woman as well as the methods to realize the highest consciousness through fulfilling your humanity. In this 50 hours course, you will identify the roadblocks on your path to conscious communication, integrating and manifesting the voice of your true self. Hold the teacher‘s voice. Empower your speaking. Deepen your listening. Sounding from the navel. Pitching from the chakras. Projecting & defending. Prayerful communication. Communication blocks; fear/anger. Hidden self, shadow self & the mask. Uplifting others through the frequency of your communication is a direct path to self-mastery. In this 50 hours course, deepen your practice of meditation, clarify the relationship between you and your mind, and explore the basic nature and dynamics of the mind. Conquer the mind and you will conquer the world. The mind is the problem yet within it is the solution. This is the opportunity for an in depth exploration of the mind, its functions, facets and projections. Learn to recognise your own tendencies and experience the meditations that transform the mind into a truly great and helpful servant of your soul. The medatative mind provides the means to be still, intuitive and creative. Our relationship to our own mind is pivotal in effectively realizing our true nature and fulfilling our potential. Yogi Bhajan often reminded us that we come to Earth to experience our humanity and recognize the One Infinite being that creates all and which is in all. The greatest power is the ability to act with a Neutral Mind, to use intuition along with applied intelligence and to lean on the Infinite through the sacred science known as prayer. Enhance the depth of your understanding of meditation and experience deep meditations on the nine aspects of the mind. Focus on your relationship to your own mind. Increase your ability to observe neutrally, to become still, to clear your mind of distractions and intrigues, to recognize when you establish a state of shuniya, and to recognize the different functional parts of your mind. Experience and practice the use of intuition as a primary skill of Kundalini Yoga and Meditation. Learn the structure of the mind and examine the impersonal minds, the qualities of the mind, and the nine aspects of the mind. Understand how to use the 27 projections of the mind. In this 50 hours course, discover mystery and mastery through every cycle of life. Review your personal biography in a manner that will set you free from the dead weight of the past and turn lead to gold. Learn to harmonise the 7, 11 and 18-year cycles of your life and why this is important. Establish your future projection so that the flow of prosperity is a natural consequence of the balance of the rhythms. Step further into the practical science of transforming your life from habits that are soul-demoting to a discipline that is soul-promoting. Learn to deeply understand our death. Confront the fear of death and learn to live weightlessly.